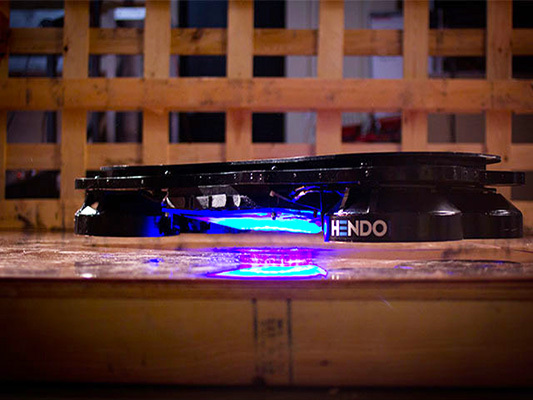 Last month we reported on the breakthrough technology behind Hendo Hoverboards. Since then, the company has almost doubled its Kickstarter goal aimed at putting the boards into production. This week they got some impressive support of a different kind — releasing a video of skateboarding legend Tony Hawk testing out one of their boards. It appears the hoverboard takes a bit of getting used to, but Hawk is put through his paces by the technology, rather than the other way around. The hoverboards work using magnetic fields. As the company says, “The magic behind the hoverboard lies in its four disc-shaped hover engines. These engines induce an opposing magnetic field in the surface substrate below that provides lift, levitating our board off the ground.” Unfortunately, that means the boards only work over their specially designed conductive surfaces. For now they also have a battery life of only seven minutes. However, the boards are only the beginning of the development of the technology and the company reports that they are making prototype breakthroughs on a daily basis. Hendo Hoverboards are also at pains to point out that the technology has many potential applications — from healthcare to transport to earthquake-resistant buildings. Anything that requires lifting and moving could potentially benefit from the technology. Hendo say they have chosen to begin production with a hoverboard as it is a relatable concept for so many people. For now though, the hoverboards ride about one inch off their substrate and can support up to 250 pounds. If you want your very own hoverboard, sadly they’ve all sold out at $10,000 a pop via Kickstarter, but there will be more available in time. And Hawk? It looks like he got the hang of the board by the end of the session and it makes for a very amusing couple of minutes’ viewing. Last month we reported on the breakthrough technology behind Hendo Hoverboards. Since then, the company has almost doubled its Kickstarter goal aimed at putting the boards into production. This week they got some impressive support of a different kind — releasing a video of skateboarding legend Tony Hawk testing out a board. It appears the hoverboard takes a bit of getting used to, however, with Hawk clearly being put through his paces by the technology, rather than the other way around.